Here is my puppy Toby Joe! He's 8 weeks old and growing fast. 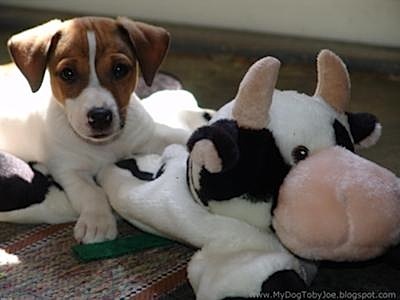 His favorite thing to do is play with Mister Cow. He loves to bite and wrestle with him and also take naps with him. Toby Joe is learning new things everyday. He is very good at the command "sit" and yesterday we learned a new game called "fetch" which he loves playing with both a tennis ball or a soft Frisbee. Looks like you've got a buddy for life. I hope you enjoy your pal as much as I do mine. He'll keep you busy, but amused and comforted all at the same time. Congratulations, Toby! I love the picture with the cow. My Bridget has her own stuffed dog and she does the same as Toby Joe...plays, chews, naps. Makes me wonder if this is a JRT trait or we just have a couple of crazy pups!